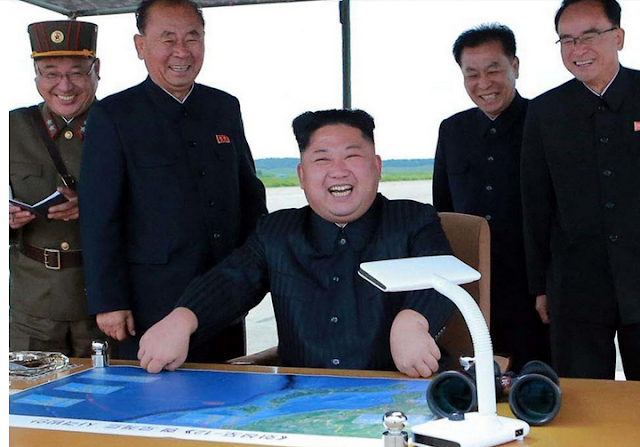 North Korea is believed to have conducted a hydrogen bomb test. Seismic shockwaves from the underground test were felt in China, and quickly detected by both South Korea and Japan – both independently confirmed it was a nuclear test. So what can seismic science tell us about such tests? What is the history of using seismic techniques to monitor nuclear tests? The use of what’s called “forensic seismology” to detect and identify nuclear tests dates back almost to the birth of nuclear weapons themselves. In 1946, the US conducted the first underwater test of a nuclear bomb at Bikini Atoll in the Pacific Ocean. The shock waves created by the huge explosion were picked up at seismometers all over the world, and scientists realised that seismology could be used to monitor these kinds of tests. In 1963, at the height of the Cold War, nuclear testing moved underground. The seismic waves from underground tests are more difficult to detect, because the shaking felt over such long distances is very small – only around one millionth of a centimetre. To measure the waves from underground tests, scientists developed more sensitive seismometer instruments and began installing seismic arrays, where multiple seismometers are deployed within a few kilometres of each other. A seismic array is better able to pick out the small vibrations from a particular source than a single seismometer, and can also be used to work out with greater accuracy where the waves originally come from. In 1996, the Comprehensive Test Ban Treaty (CTBT) was opened for signatures, aiming to ban all nuclear explosions. To enforce this treaty, the Vienna-based CTBT Organisation is establishing an International Monitoring System with over 50 seismic monitoring stations to detect nuclear tests anywhere on Earth. This system doesn’t just use seismometers. Infrasound instruments listen for very low frequency sound waves, inaudible to the human ear, generated by potential nuclear explosions in the atmosphere; hydroacoustic instruments listen for sound waves travelling long distances through the oceans generated by underwater explosions, and radionuclide detectors “sniff out” radioactive gases released from a nuclear test site. What do seismic monitors look for? Any sort of earthquake or explosion, whether natural or man-made, produces different sorts of shock waves which travel through the Earth and can be detected by seismometers, which can measure very small ground movements. The fastest waves to arrive are the primary waves (P waves), followed by secondary waves (S waves), which travel deep through the Earth. Then come the slower surface waves, which cause the most shaking felt at ground level because they only travel close to the surface. Seismometers use the difference in the arrival times of the different types of wave to figure out how far away an earthquake or explosion occurred, and how deep underground its source was. They can also measure how powerful the earthquake was (its magnitude). How do seismologists distinguish between an explosion and an earthquake? There are a number of ways to do this. One is to measure the depth at which the earthquake occurred. Even with modern drilling technology, it is only possible to place a nuclear device a few kilometres below the ground; if an earthquake occurs at a depth of more than 10km, we can be certain it is not a nuclear explosion. Studies of the numerous nuclear tests that took place during the Cold War show that explosions generate larger P waves than S waves when compared with earthquakes. Explosions also generate proportionally smaller Surface waves than P waves. Seismologists can therefore compare the size of the different types of wave to try to determine whether the waves came from an explosion or a natural earthquake. For cases like North Korea, which has carried out a sequence of nuclear tests since 2006, we can directly compare the shape of the waves recorded from each test. As the tests were all conducted at sites within a few kilometres of each other, the waves have a similar shape, differing only in magnitude. What can seismology tell us about the most recent test? Seismological data can tell us whether there was an explosion, but not whether that explosion was caused by a nuclear warhead or conventional explosives. For final confirmation that an explosion was nuclear, we have to rely on radionuclide monitoring, or experiments at the test site itself. Similarly, we cannot explicitly differentiate between a nuclear fission bomb and a thermonuclear hydrogen bomb, nor can we tell if a bomb is small enough to be mounted on a missile, as the North Korean government claims. What we can get from the data is an idea of the size of the blast. This isn’t simple, as the magnitude of the seismic waves and how they relate to the explosive power of the bomb depends a lot on where exactly the test took place, and how deep underground. But in the case of this latest test, we can directly compare the magnitude to previous North Korean tests. This latest explosion is considerably more powerful than the north’s last test in September 2016; the Norwegian seismic monitoring centre, NORSAR, estimates an explosion equivalent to 120 kilotons of TNT. For comparison, the bombs dropped on Hiroshima and Nagasaki in 1945 yielded 15 and 20 kiloton blasts respectively. Despite the caveats above, the improved sensitivity of the available instruments and the increased number of monitoring stations means there is now a very reliable network in place to detect nuclear tests anywhere on the planet. Even though the Comprehensive Test Ban Treaty is not in force, the scientific expertise of those investigating such events is always improving. The fact that monitoring agencies in Japan and South Korea confirmed this latest test within hours shows just how impressive it can be. Neil Wilkins is a PhD candidate at the School of Earth Sciences at the University of Bristol.